Ne plus ultra bizarre, man! With cartilaginous prose, soft as fishbone, sense-bending and scattershot as a Robin Williams shtick where lost meanings blast by, Dakron's third follows the comet trails of Infra and Newt (neither reviewed) with a morphological plot out of Ovid by way of Kafka--but doesn't quite win the blue ribbon. Nico, a 33-year-old geneticist for Zylogen, a med tech firm, is extracting material from hammerhead shark fetuses in order to create a serum against shock in humans: Sharks are shockproof and, if disemboweled, will eat their own guts. The serum seems to work on mice, and, rather than wait for FDA approval for tests on humans, Nobel-hungry Nico administers Serum H to herself. Alas, poor Nico! There's too much shark DNA grafted onto the virus she's popping, and Nico herself morphs into a hammerhead shark. To grasp even this much story, however, one must extract plot serum from the self-reflexive and cursive swish of Dakron's eye-bobbling wordflow (``Move your fin to the left, my leetle cabbage, yes? Mmmm, ce qua belle-pardon? . . . Ha ha, you never tire . . . hush. Let me whisper it then, shhh, let me whisper about the squid in drag. . . ``). When Nico visits her brother Zave (Xavier), who sells fish in Seattle's Pike Place Market, Zave notices that she has nictitating membranes protecting her eyes. Then shark teeth push out Nico's choppers. Her senses mutate into shark senses--she gains an nth sense or radar that's a blend of seeing and hearing and touching, she hears with her whole skin, sees wisps of voltage everywhere. 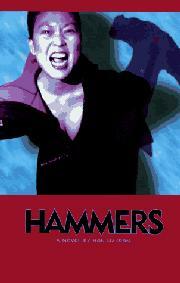 Then Zave, his ex-girlfriend Tina, and two junkies also take Serum H and turn hammerhead. As the women swim off, later to be attacked by the junkies, Zave lies slowly growing gills and scales in his bathtub, avoiding SWAT teams while he writes this account on his laptop and waits to swim after the girls. As storytelling, Steve Alten's thriller Meg (p. 568), about a 60-foot Jurassic shark, leaves Hammers too literary by half and gasping on the shore.